Marine Corps basic training has the reputation of being the toughest of all the services. It most certainly is the longest, at about 12 1/2 weeks. It has been said time and time again by former Marines that Marine Corps recruit training was the most difficult thing they ever had to do in their entire lives. There are two locations which turn recruits into Marines: the Recruit Training Depot at Parris Island, South Carolina, and the Recruit Training Depot at San Diego, California. Where you go depends largely on where you enlist. Those who enlist west of the Mississippi River will likely go through boot camp in San Diego while those in the East will attend at Parris Island. 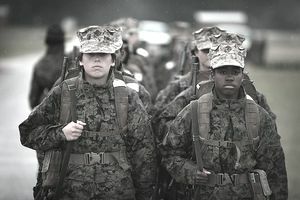 All women attend Marine Corps basic training at the Parris Island location. In fact, the Marine Corps is the only service that doesn't have coed basic. Female Marines train on their own, separated from the men. You'll pass the same test shortly after arrival at basic. Those who fail are transferred to the PCP (Physical Conditioning Platoon). PCP is tough: PCP's objective is physical fitness, and that's what you'll be concentrating on while in the program. You'll remain in the PCP until you can meet the standards, but for a minimum of 21 days. All Marines are granted 10 days' leave (vacation) immediately after basic training. Following leave, Marines who are in the Infantry Field (MOS of 0311 Rifleman, 0331 Machinegunner, 0341 Mortarman, 0351 Assaultman, or 0352 Anti-Tank Guided Missleman), attend the 51-day School of Infantry, at either Camp Lejeune, NC, or Camp Pendleton, CA. This school also doubles as their Marine Corps job school so upon graduation they proceed to their first duty assignment. All other Marines attend the 22 day Marine Combat Training (MCT) course, also located at Camp Lejeune or Camp Pendleton. Upon graduation from this course, they proceed to their Marine Corps job training school.